Stephen Neale has just been released from an asylum during World War 2 in England when he stumbles on a deadly Nazi spy plot by accident, and tries to stop it. The Tragic Romance of Max Ophüls’ "Liebelei"
British hunter Thorndike vacationing in Bavaria has Hitler in his gun sight. He is captured, beaten, left for dead, and escapes back to London where he is hounded by German agents and aided by a young woman. 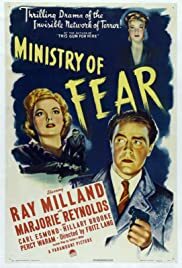 After the Nazi administrator of Czechoslovakia is shot, his assassin tries to elude the Gestapo and struggles with his impulse to give himself up as hostages are executed. When a conservative middle-aged professor engages in a minor dalliance with a femme fatale, he is plunged into a nightmarish quicksand of blackmail and murder. When a lovely woman and her new husband settle in an ancient mansion on the East coast, she discovers that he may want to kill her. When a man in mid-life crisis befriends a young woman, her venal fiancé persuades her to con him out of the fortune they mistakenly assume he possesses. In WW2, the Allies race against time to persuade two nuclear scientists working for the Germans to switch sides. A deranged writer murders a maid after she resists his advances. The writer engages his brother's help in hiding the body, and then watches as the brother becomes the prime suspect. When a wrongly accused prisoner barely survives a lynch mob attack and is presumed dead, he vindictively decides to fake his death and frame the mob for his supposed murder. A serial killer has been killing beautiful women in New York, and the new owner of a media company offers a high ranking job to the 1st administrator who can get the earliest scoops on the case. After the murder of his fiancée, a Wyoming ranch hand sets out to find her killer. A Korean War vet returns to his job as a railroad engineer and becomes involved in an affair with a co-worker's wife following a murder on a train where they meet. Willi Hilfe: We thought you'd been killed. If you like Hitchcock's "39 Steps" or "The Man Who Knew Too Much", you're likely to enjoy this one, too. It's weakness, in comparison to "39 Steps" lies in a frustratingly shallow treatment of the characters. Development of the relationship between the protagonist Neale and the very photogenic Fraeulein Hilfe is disappointingly sketchy - and their unwavering trust in each other - and love - essentially instantaneous, not gradually won through tension, doubt and adversity. And our doubts concerning Neale's time in prison for murder are defused all too quickly, assuring us he's no "Stagefright" personality. I can't help thinking Lang attempted to emulate "39 Steps". The result's a fun film, with wonderful close-ups of a very young Millan and his girl, but of "thinner fabric". As in "39" or "North by Northwest", the plot doesn't resist much scrutiny - the bad guys' judgment pretty lame. The fun lies in character eccentricities, great photography, the creation of an artificial universe, etc. Personally, I find "Man Who Knew Too Much" too long, impossible to sit through a second time, excessive in several ways - overacted, over-dramatized; this film, like "39" or "North by Northwest", I have no problem watching again and again. 31 of 43 people found this review helpful. Was this review helpful to you?